A personal favorite saint of mine, St. Xenia of St. Petersburg, is a beacon of light for those going through college. 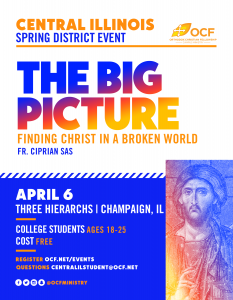 Her life is a wonderful example for how we should conduct ourselves and her intercessions are particularly relevant to the stresses an average college student faces…finding a job and finding love. Our righteous Mother Xenia of Petersburg was born about the year 1730. She was married to a Colonel named Andrew; when she was twenty-six years old, her husband died suddenly, having been drinking with his friends. Left a childless widow, Xenia gave away all that she had, and vanished from Saint Petersburg for eight years; it is believed that she spent this time in a hermitage, learning the spiritual life. When she returned to Saint Petersburg, she wore her husband’s military clothing, and would answer only to the name Andrew, that is, the name of her late husband. She took up the life of a homeless wanderer, and was abused by many as insane; she bore this with great patience, crucifying the carnal mind through the mockery she endured, and praying for her husband’s soul. She was given great gifts of prayer and prophecy, and often foretold things to come; in 1796 she foretold the death of Empress Catherine II. Having lived forty-five years after her husband’s death, she reposed in peace at the age of seventy-one, about the year 1800. Her grave became such a source of miracles, and so many came to take soil from it as a blessing, that it was often necessary to replace the soil; when a stone slab was placed over her grave, this too disappeared over time, piece by piece. Saint Xenia is especially invoked for help in finding employment, lodging, or a spouse. St. Xenia has the clairvoyance that personally, I wish I had because the future can be frankly terrifying. “Will I find a job?” “Where am I going to live after college?” “Will I ever find a significant other?” “Will I ever get married?” These are the questions countless college students ask themselves because there is so much uncertainty and competition that we really do need divine intervention for guidance in our lives, and towards the Kingdom. 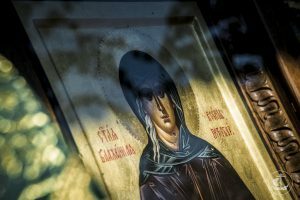 St. Xenia was married, lived a somewhat wealthy life, was young, and had things going well for her in her life–the “American dream” as we would now describe. But one day, she lost her husband, and she felt not only the pain of the loss, but the pain of a lost future. Her life was set up, and one day she felt that it was taken all away. Personally, I can’t even imagine the anguish she must have felt during that time. What makes St. Xenia special to us, and special to God, was that in her times of suffering, she turned to Him to transform her. She gave away all she had, and because of that, people used to think she was actually crazy. People who highly regard earthly pleasures would think that giving away all you have would be crazy. However, St. Xenia saw her spiritual poverty and sought to be transformed and align her life towards the Kingdom. She learned how to pray and how to follow the spiritual life. I’m sure people understand the importance of having a spiritual father and that many have given advice to seek one. LEARN! Priests are trained to be people’s spiritual fathers, and they have their own spiritual fathers themselves! The right spiritual instruction helped cultivate St. Xenia into the saint that she is today. St. Xenia had incredible humility. She was so humble that she wanted to bear not only her own sins but that of her husband and assumed his name. Through the sacrament of marriage, she and her spouse became one, and in her persistence to make her life a Kingdomly one, she assumed his name and was willing to bear their cross, suffering much physical and emotional torment. St. Xenia intercedes for those looking for a spouse and looking for a job. I urge you all to ask for her help! The job market and love markets are tough out there, and a little saintly push from the spiritual master that is St. Xenia can give you hope and guidance. Also, St. Xenia was known to only take copper pennies during her earthly life, so, make a little donation to the poor or to your church in her name, so you can be like the people who were able to receive her blessings whilst living on earth.